Did someone say carb-free pasta? This recipe will show you how to cut the calories out of your favourite Italian dish but without sacrificing the flavour. One of the things I miss most about not eating wheat, is pasta, I know you do get gluten-free options but eating carbs during the week is a real no-no. Here is my Mom’s famous Bolognese recipe with zucchini spaghetti. In a food processor (with the blade attachment) chop the onions, garlic, chili and celery, then grate the carrots. On high heat, place the pot and 2 tablespoons of olive oil and add all the vegetables- fry for 5-10 minutes or until they are nice and soft and the kitchen is smelling beautiful (make sure they don’t burn). Add the tomato paste, herbs and star anise and cook for 3 minutes. Add the mince in stages- this makes it more manageable. Use a wooden spoon and break up the mince until there are no chunks of meat. Cook for 5 minutes or until the meat has turned colour. Then add the wine and simmer for 2-3 minutes. Add the stock and cook for another 3 minutes. Then add the tinned tomato, sugar, bay leaf and turn the heat down and simmer for 40 minutes (the longer the meat cooks the richer the flavour). Flavour to your taste, and don’t forget to taste continuously. On the pack it says cook the zucchini for 2 minutes in the microwave, but the thing with baby marrow is that it is mostly water, so don’t forget to drain it before serving. Grate the Parmesan and garnish with fresh basil and you’re good to go. 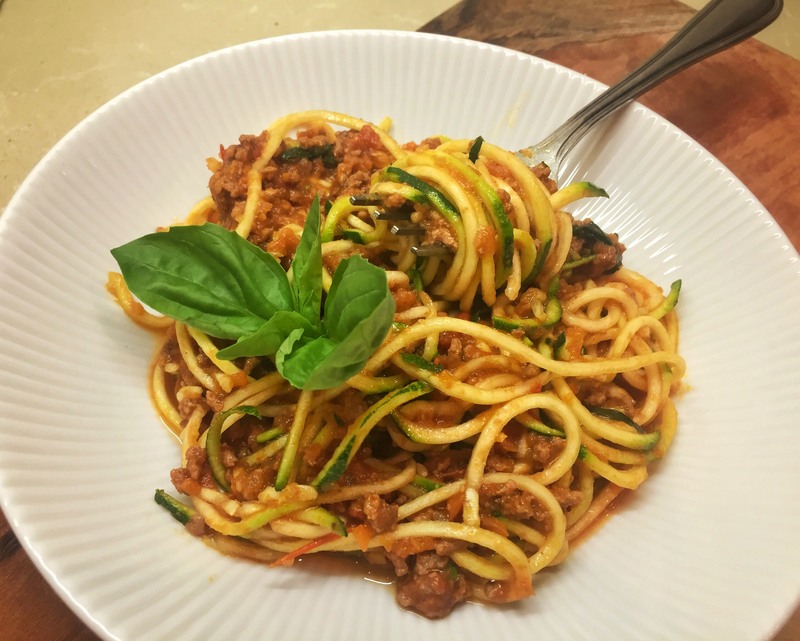 This entry was posted in Meat dishes, Recipes, Tips and tagged basil, Bolognese, carb-free, healthy, Italian, mince, Zucchini spaghetti. Bookmark the permalink.